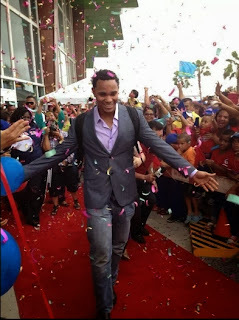 On Wednesday, October 30th, Xander Bogaerts became the first player from Aruba to win a World Series title. On Sunday he returned home to a hero's welcome including confetti and a red carpet at the airport. Bogaerts joined the Major League club in August and started every game of the World Series. He originally started the postseason on the bench but stepped up when Will Middlebrooks struggles in the postseason peaked in the ALCS. Bogaerts was the first player from Aruba to every play in the World Series. After winning the title Bogaerts said his phone was not working, he was so popular and he was receiving so many calls and text messages. Before the World Series began, Bogaerts was asked if he would be able to go to the corner store without being bothered, his response was "I don't know. But I definitely will try. I know Aruba is probably crazy right now. I don't know what I'll do yet. But I definitely know I'll go to the beach". Well Xander after the reception you got at the airport it looks like you will be signing autographs everywhere you go, even if it is at the corner store. This postseason Bogaerts made a strong case for a starting position battle on the left side of the infield next spring training. With Bogaerts being only 21 it looks like the future is bright for young Xander.